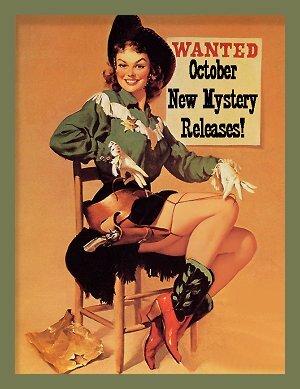 October 2015 New Mystery Releases! One thing that doesn't change is my never-ending quest for new crime fiction. 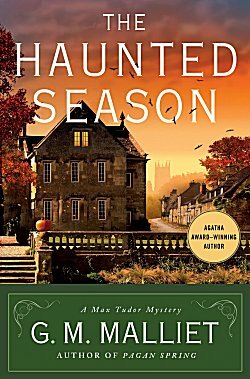 The following books are my picks of the new mysteries being released during the month of October. They are grouped by release date and include all the information you'll need to find them at all your favorite book spots. Synopses are courtesy of Amazon. Happy Wish Listing and Happy Reading! Synopsis: "Anna Hopkins’ daily walk through Oxford’s picturesque Port Meadow is rudely interrupted one autumn morning when her white German Shepherd, Bonnie, unearths a bloodsoaked body in the undergrowth. For Anna it’s a double shock: she’d met the victim previously. Naomi Evans was a professional researcher who had told Anna she was working on a book about a famous Welsh poet, and who offered to help Anna trace Bonnie’s original owner. From her conversations with Naomi, Anna is convinced that she was not the random victim of a psychopathic serial killer, as the police believe. She was targeted because of what she knew. With the official investigation heading in the wrong direction entirely, Anna teams up with fellow dogwalkers Isadora Salzman and Tansy Lavelle to discover the truth." Synopsis: "South Korea, 1970s: A young Korean woman dressed in a traditional chima-jeogori is found strangled to death on the frozen banks of the Sonyu River with only a carefully calligraphed poem in her sleeve. George Sueño and Ernie Bascom, sergeants in the US 8th Army CID, are called in by the formidable KNP detective Gil Kwon-up to investigate. George and Ernie's job is to liaise with Korean law enforcement on matters that may involve or implicate 8th Army American servicemen. But as they learn about the case, George and Ernie realize this isn't their jurisdiction—the nearby village of Sonyu-ri is occupied by the US Army's 2nd Infantry Division, a disciplined and often brutal force that won't stand for outside officers questioning its men. 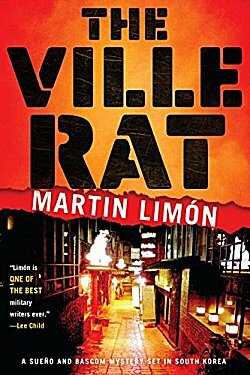 All that George and Ernie are able to glean before being kicked out of town is that they are close to the truth—and that a mysterious smuggler, known locally as "the Ville Rat," holds the key to the woman's murder. Luckily, the pair is officially assigned another investigation in the area, which allows them to continue nosing around for answers. They are to elucidate the circumstances of a shooting incident between a young African American private and his white supervising chief. Racial tensions run high, and George and Ernie must tread carefully to solve both cases. But they aren't exactly known for going out of their way to avoid stepping on US Army toes, and this is no exception." Synopsis: "Something sinister is stirring at Totleigh Hall, the showcase of the English village of Nether Monkslip. Usually, the Lord and Lady of the manor are absent-high tax rates, it is murmured with more than a trace of envy, force them to live on the continent for most of the year. But Lord and Lady Baaden-Boomethistle have been in residence for some weeks now, and the villagers are hoping for a return to the good old days, when the lord of the manor sprinkled benefits across the village like fairy dust. Father Max Tudor's invitation to dinner at the Hall comes as a welcome novelty; it will be his first time meeting the famous family that once held sway in the area. 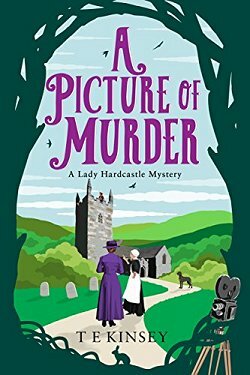 But before he has time to starch his clerical collar and organize a babysitter, a sudden and suspicious death intervenes, and the handsome vicar's talent for sorting through clues to a murder is once again called into play in this charming and clever novel." 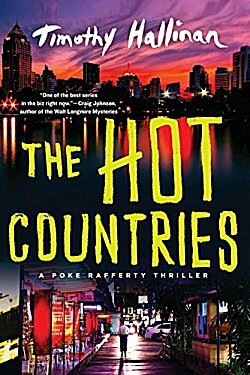 Synopsis: "Back when Poke Rafferty first arrived in Bangkok to write a travel guide, some of the old-timers in the Expat Bar on Patpong Road helped him make sense of the city. Now these men—many of whom have been living in Southeast Asia since the Vietnam War—have grown old and, in some cases, frail. When a talkative stranger named Arthur Varney turns up, they accept him without suspicion, failing to see that he’s actually using them to get to Poke. Varney wants two things: money Poke doesn’t have and a person Poke is unwilling to hand over. It becomes apparent quite quickly that there’s nothing Varney won’t do to secure his goals. As his actions threaten the foundation of Poke’s life in Thailand, the aging men of the Expat Bar discover that they might still be a force to reckon with." Synopsis: "Delphi once stood at the center of the world, a mountainous, verdant home to the gods, where kings and warriors journeyed to hear its Oracle speak. The Oracle embodied the decree of the gods―or at least the word of Apollo. To disobey risked…everything. 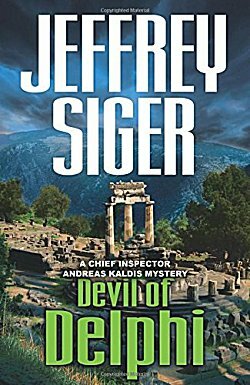 When Kharon unexpectedly shoots a member of one of Greece’s richest, most feared families, he draws Chief Inspector Andreas Kaldis into the eye of a political and media firestorm threatening to bring down Greece’s government. Think Breaking Bad, Greek-style." Synopsis: "When Alice Ramsay, artist and alleged witch, is found dead in her home in a remote Scottish glen, the verdict is suicide. But Joanne Ross of the Highland Gazette refuses to believe it. As she investigates Alice’s past, Joanne uncovers layer upon layer of intrigue. With the appearance of officials from a secretive government agency and an ambitious art critic from a national newspaper, Joanne is increasingly convinced that something—and someone—from Alice’s past was involved in her death. 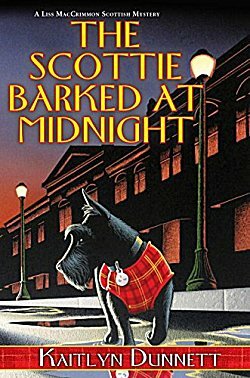 As in her previous mysteries North Sea Requiem, Beneath the Abbey Wall, and A Double Death on the Black Isle, among others, A. D. Scott brings to life compelling characters and vividly portrays the charms and intrigues of a small town in 1950s Scotland. 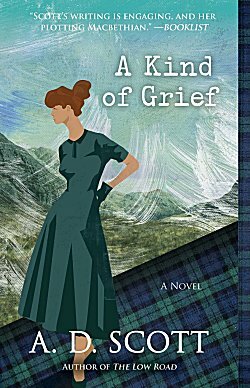 With surprising twists and a shocking dénouement that poses moral questions as relevant now as six decades ago, A Kind of Grief is another unforgettable entry in an atmospheric series that will draw you in and linger in your mind like mist over the Scottish glens." Synopsis: "For Samuel Hoenig, Asperger's isn't so much a syndrome as it is a set of personality traits. And as the sole proprietor of a business called Questions Answered, Samuel's put his personality traits to good use, successfully answering every question he's ever been asked. But when his newest client asks about the true identity of her so-called husband, Samuel recruits his former associate Janet Washburn for insight into a subject that's beyond his grasp—marriage. Working as a team seems to be the right approach . . . until the inscrutable spouse is found dead in Samuel's office. Feeling like he's been taken for a fool, Samuel is more than willing to answer a new question posed by an unexpected inquirer: who killed the unfamiliar husband?" 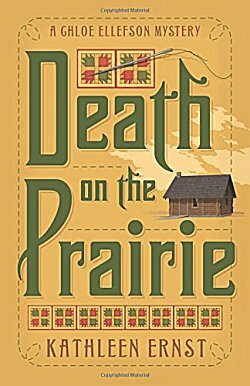 Synopsis: "Chloe Ellefson and her sister, Kari, have long dreamed of visiting each historic site dedicated to Laura Ingalls Wilder. 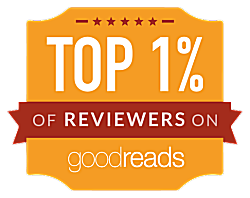 When Chloe takes custody of a quilt once owned by the beloved author, the sisters set out on the trip of a lifetime, hoping to prove that Wilder stitched it herself. But death strikes as the journey begins, and trouble stalks their fellow travelers. Among the "Little House" devotees are academic critics, greedy collectors, and obsessive fans. Kari is distracted by family problems, and unexpected news from Chloe's boyfriend jeopardizes her own future. As the sisters travel deeper into Wilder territory, Chloe races to discover the truth about a precious artifact—and her own heart—before a killer can strike again." Decades later, Alice is living in London, having enjoyed a long successful career as an author. Theo’s case has never been solved, though Alice still harbors a suspicion as to the culprit. Miles away, Sadie Sparrow, a young detective in the London police force, is staying at her grandfather’s house in Cornwall. While out walking one day, she stumbles upon the old estate—now crumbling and covered with vines, clearly abandoned long ago. Her curiosity is sparked, setting off a series of events that will bring her and Alice together and reveal shocking truths about a past long gone...yet more present than ever." 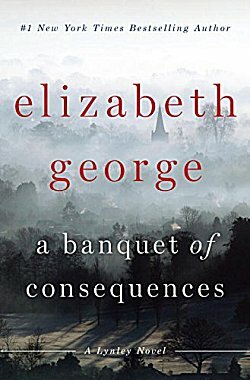 Synopsis: "The unspoken secrets and buried lies of one family rise to the surface in Elizabeth George’s novel of crime, passion, and tragic history. As Inspector Thomas Lynley investigates the London angle of an ever more darkly disturbing case, his partner, Barbara Havers, is looking behind the peaceful façade of country life to discover a twisted world of desire and deceit. After various career-threatening issues with her department, Barbara Havers is desperate to redeem herself. So when a past encounter with a bestselling feminist writer and her pushy personal assistant gives her a connection to the Cambridge murder, Barbara begs Thomas Lynley to let her pursue the crime. Full of shocks, intensity and suspense from first page to last, A Banquet of Consequences reveals both Lynley and Havers under mounting pressure to solve a case both complicated and deeply disturbing." Synopsis: "December 1941. Soon after the attack on Pearl Harbor, Winston Churchill arrives in Washington, D.C., along with special agent Maggie Hope. Posing as his typist, she is accompanying the prime minister as he meets with President Roosevelt to negotiate the United States’ entry into World War II. 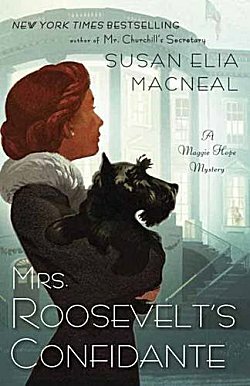 When one of the First Lady’s aides is mysteriously murdered, Maggie is quickly drawn into Mrs. Roosevelt’s inner circle—as ER herself is implicated in the crime. Maggie knows she must keep the investigation quiet, so she employs her unparalleled skills at code breaking and espionage to figure out who would target Mrs. Roosevelt, and why. What Maggie uncovers is a shocking conspiracy that could jeopardize American support for the war and leave the fate of the world hanging dangerously in the balance." Synopsis: ""There's no easy way to say this, Kubu. Your father's dead. I'm afraid he's been murdered." 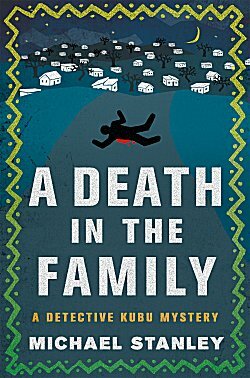 Set amidst the dark beauty of modern Botswana, A Death in the Family is a thrilling insight into a world of riots, corruption, and greed, as a complex series of murders presents the opera-loving detective with his most challenging case yet. 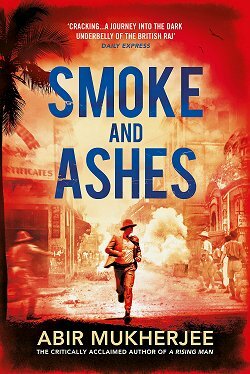 When grief-stricken Kubu defies orders and sets out on the killers' trail, startling and chilling links emerge, spanning the globe and setting a sequence of shocking events in motion. Will Kubu catch the killers in time?" Synopsis: "Spring is just a few weeks away, but winter is still digging its claws into tiny Moosetookalook, Maine. 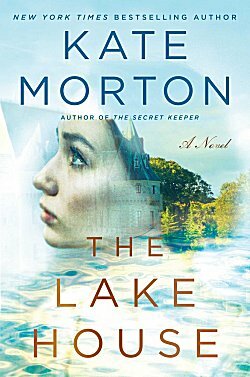 Even business at the Scottish Emporium has frozen up, so Liss MacCrimmon is cautiously optimistic when a twist of fate lands her on a reality competition show--until the contest gets a little too cutthroat. . .
Deidre's daughter asks Liss to help find out what happened to her mother--and to take Deidre's place on the upcoming show. Before Liss can tell her she's barking up the wrong tree, she finds herself ensnarled in the strange world of reality competitions and hot on the trail of a deadly dognapper. And just as she starts pawing at the truth, Liss realizes she could be next on the murderer's list." Wow! There's definitely a little something for everyone on this list, isn't there? Five of my favorite authors... all in the same month. October is definitely a budget-busting month for crime fiction in this house! Which titles caught your eye? Inquiring minds would love to know! Oh, my, Cathy! A new Hallinan and a new Michael Stanley! 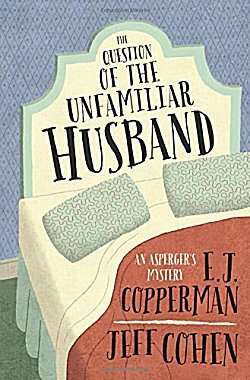 And I love that title: The Question of the Unfamiliar Husband. It's fabulous! So many wonderful books and series that I haven't tried. And a new Kate Morton book and a new Maggie Hope. Yay! Hope you two had a great trip!! We did, although I'm finding it a struggle to get back in the saddle. I had too many blogging routines set up to keep me on track and now I feel cast adrift! 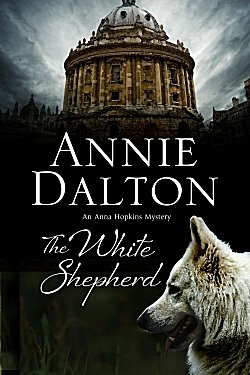 The Annie Dalton series looks good to me, and nice cover! 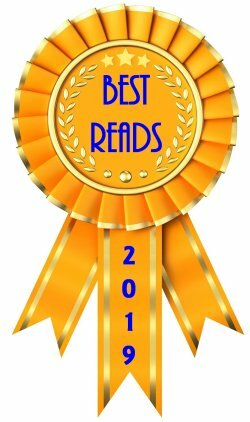 I love to discover new to me authors, so I will be checking out all your books further. I haven't read any of them, but the majority of my books I read are mysteries/suspense thrillers. Thanks! You're very welcome, Rita! October has new books from some of my favorite authors: Timothy Halllinan, Susan Elia MacNeal, Michael Stanley, A.D. Scott, Jeffrey Siger.... an embarrassment of riches!